In Daniel chapter 5, a Babylonian king by the name of Belshazzar mocks God by throwing a party with articles taken from the Jewish temple. As a result, God passes judgement on Belshazzar by taking away his kingdom and dividing it between the Medes and Persians. The first thing they say is that the last king to rule the empire of Babylon before being captured by the Medes and Persians, was a man by the name of Nabonidus, not Bel-shazzar. Secondly, Belshazzar was never a king of Babylon. And third, the Bible refers to Nebuchadnezzar as the father of Belshazzar, which he wasn't. First of all, Belshazzar's name is found in archaeology, and he just happens to be the son of King Nabonidus, making him a crown prince in the kingdom of Babylon. And although some translations of the Bible state that Nebuchadnezzar was his father, the Hebrew word for father can also be interpreted into English as meaning grandfather or ancestor. And in fact, Belshazzar was a blood line descendent of Nebuchadnezzar. The same goes for the fact that the Bible calls Belshazzar a king. Even though historical records do not mention he was a king, the Hebrew word for king can also be interpreted as governor or royal prince. Nabonidus, who ruled the empire of Babylon from 555-538 B.C., mentions his firstborn son Belshazzar on an inscription found in the city of Ur in 1853. The inscription reads: "May it be that I, Nabonidus, king of Babylon, never fail you. And may my firtstborn, Bel-shazzar, worship you with all his heart." "Putting the camp under the rule of his oldest son, the firstborn. The army of the empire he placed under his command. His hands were now free; He entrusted the authority of the royal throne to him. " "In regards to the bright star which has appeared, I will undertake to interpret its meaning for the glory of my lord Nabonidus, Babylon's king, and also for the crown prince, Belshazzar"
The text from an artifact known as the Nabonidus chronicle states: "Nabonidus, the king stayed in Tema; the crown prince, his officials and the troops were in Akkad." "A coward was put in charge as the king of this country . . . With evil intents he did away with the regular offerings to the gods . . . and desecrated the worship of the king of his gods, Marduk." 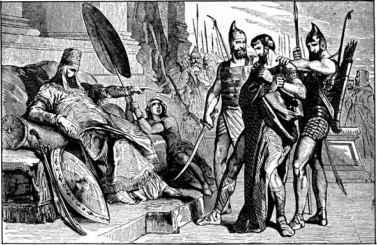 Liberal Bible scholars say that according to history there was no such man as Darius the Mede and say that the writer of scripture must have gotten him mixed up with a later king named Darius of Persia. But this apparent error can also be explained. First of all, the "Babylonian Chronicles" tell us the exact date which Babylon fell. October 13, 539 B.C. On the 16th day, Gubaru (Darius the Mede) the leader of Gutium along with the army of Cyrus entered Babylon without any opposition. Later they arrested Nabonidus when he returned to Babylon." On the third day of the month of Arahshamnu, Cyrus marched into Babylon, and they laid down green branches in front of him. The city was no longer at war, Peace being restored. Cyrus then sent his best wishes to the residents living there. His governor, Gubaru, then installed leaders to govern over all Babylon." This account says that Darius the Mede installed sub governors in Babylon. 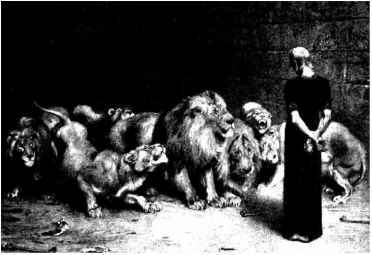 The Bible says the same thing, and the prophet Daniel was one of them: "It pleased Darius to set over the kingdom one hundred and twenty satraps, to be over the whole kingdom; and over these, three governors, of whom Daniel was one, that the satraps might give account to them, so that the king would suffer no loss. Then this Daniel distinguished himself above the governors and satraps, because an excellent spirit was in him; and the king gave thought to setting him over the whole realm. So the governors and satraps sought to find some charge against Daniel concerning the kingdom; but they could find no charge or fault, because he was faithful; nor was there any error or fault found in him." Daniel 6:1-4 This was the same Darius the Mede who had the prophet Daniel thrown into the lions den, mentioned in Daniel Chapter six.